Most advanced computer users know about speedtest.net that helps testing your internet bandwidth. While it is a great tool, it has only flash version available on their web site and there are Android and iOS apps for your mobile phones, but there were no tools available for Linux servers without GUI. Back in 2009 I made a PHP script that tested network speed, wrote the results to text file and generated PNG graphs to be shown on web. It used speedtest.net partner servers and it got the data usage from ifconfig thus making it read the total bandwidth, not just what had been left for the php script itself. I set it up on my home router so I could prove my ISP that their internet is far form what they advertised. I also uploaded it to Sourceforge and forgot about it’s existence for some time. Years have passed and it has been downloaded almost 17 000 times, even though it doesn’t really work in every case and it wasn’t that easy to set up. So I figured I should make a new version, written in Python (just to practice it), and so I did. It is licensed under MIT license. There are still some bugs and planned features left to sort out, but after testing it on multiple computers it is working fine. Tespeed in automatic mode looking for best testing server and doing download and upload tests. The new version finds closest servers and then picks the one with lowest latency. You can also get a list of all available servers (and see the approximate distance to them) by using list-servers command. Please send me some feedback so I could make it better. Downloaded and installed. Works fine in my computer… Now i have an nice and simple command line tool for getting a network speed measure. Thanks for sharing Janis. When testing it on different hosts i got a 404 on one of them. This server seems to be detected at 0ms and sets a wrong url in de server_list var. Maybe better to cut of everything after last / then just to remove the last 10 chars. Thanks, I think someone has already reported this on Github and I’m going to add the fix in a free moment. You can, I think I wrote about it in the README. Sure, you can do that but it shows only download speed and tests with single server that is probably not close to yours. this is perfect! i spent hours trying to find out how to determine my VPS’ upload speed and this program solved it! thanks a lot! I have successfully installed your utility on a local Ubuntu system and it works great! I have also installed it on a remote server running CentOS5. This gives me some errors. Getting ready. Use parameter -h or –help to see available features. File “./testspeed.py”, line 533, in ? You could also try removing timeout parameter from urllib2.urlopen calls. After installing several missing packages, I get this. It’s a Centos 5 box. File “./tespeed.py”, line 12, in ? Now I am getting this error, probably because centos 5.8 old phyton version. Ok, now i see this issue has been commented before, sorry! Adding date and time fields to the front of the CSV output would be a nice. Installed on Ubuntu server 12.04 LTS. Works nicely. Is this something to do with Python thread performance or should I have a serious conversation with my ISP? No, it is fine. Just look at the highest speeds. 2. Is possible get the image result, but how get it? I’m a complete amateur but would really like to get this neat little utility going. I have installed Python 2.7.5 (http://www.python.org/ftp/python/2.7.5/python-2.7.5.amd64.msi) and lxml (https://pypi.python.org/packages/2.7/l/lxml/lxml-3.2.1.win-amd64-py2.7.exe#md5=f981319fb3a0d7e2aa19889081e8aa87) and have then run the script in the Windows CLI as “python tespeed.py”. Do you have any suggestions for what is going wrong & what to do about it? Any ideas on this “global name ‘args'” error? I have this same issue with Python 2.7 for Windows. Is it possible to add result time? say like “Download Speed at 11-Jul-2013 22:22:11 is 8.9MB. this will help monitor the speed test. also save result in txt or csv file? i tried modifiying it but with no success. argparse is no longer a valid install module for apt-get. I have tried apt-get install python-argparse but it has been deleted a little while back. I know my errors are similar to the ones shown above but your answer back then was to update python. I am updated. Just installed 2.7.3 from Ubuntu with the apt-get install python-lxml …it did everything needed but it’s still not working. 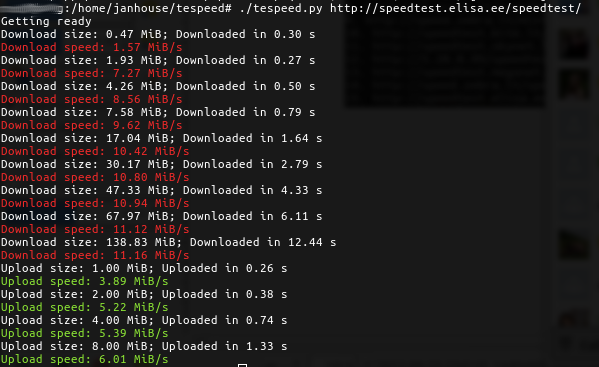 I can get it work if the speedtest.py is placed inside the tespeed directory-which is where the SocksiPy resides.I’m a bit of a Linux newbie-does this sound right? Thanks-great script, by the way! I am unable to run it on windows. I have downloaded the socksipy file to library. when i am running through CMD it shows me error at no module named socksipy. Error NameError: global name ‘args’ is not defined on Windows Server 2012 with Python 27 solved by commenting out row 604.
tespeed gives me strangely low results. I’m not sure if you are aware, but there is another command line utility for speedtest.net (written in Python) that has been available for a few years. It is available at https://github.com/sivel/speedtest-cli (installable via pip install --user speedtest-cli). I’m curious to try this out and see how it compares. Thanks!